Rustic country style baby showers are popular right now and for a good reason. Rustic theme looks awesome and works for either gender. With simple decorations you can create the perfect atmosphere. Twinkling lights and pretty flowers go a long way. 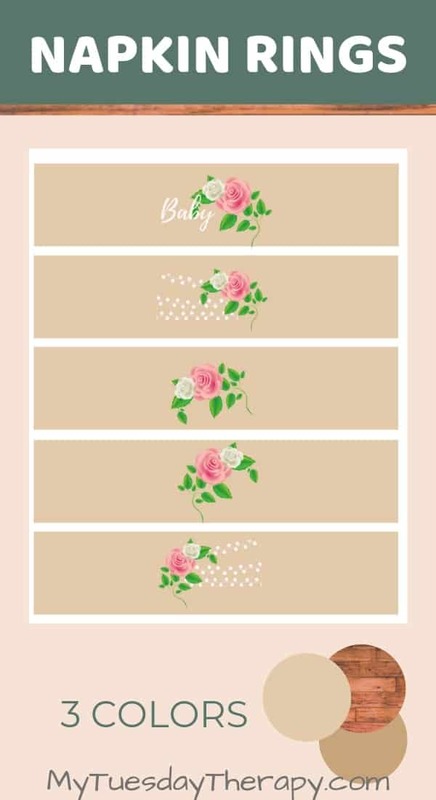 Rustic baby shower printables add a simple nice touch to the baby shower. From centerpieces to chocolate bar and cupcake wrappers you’ll find it all here. 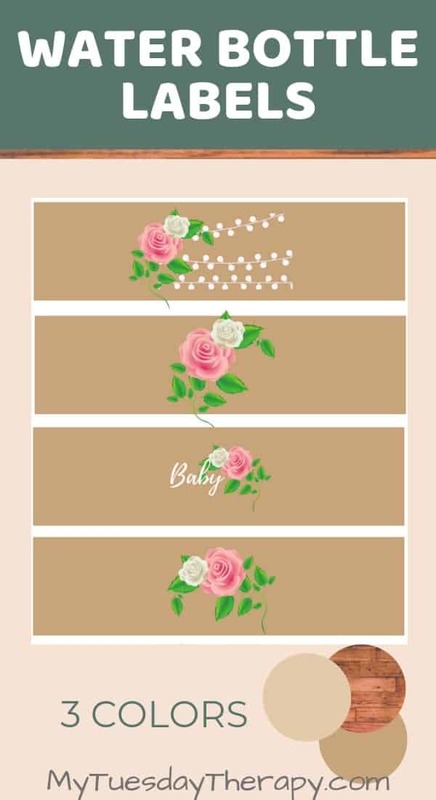 You’ll love this collection of rustic baby shower printables. I’ll give you a link to a sample page so you can see what the colors look like printed. and 9 fun baby shower games. 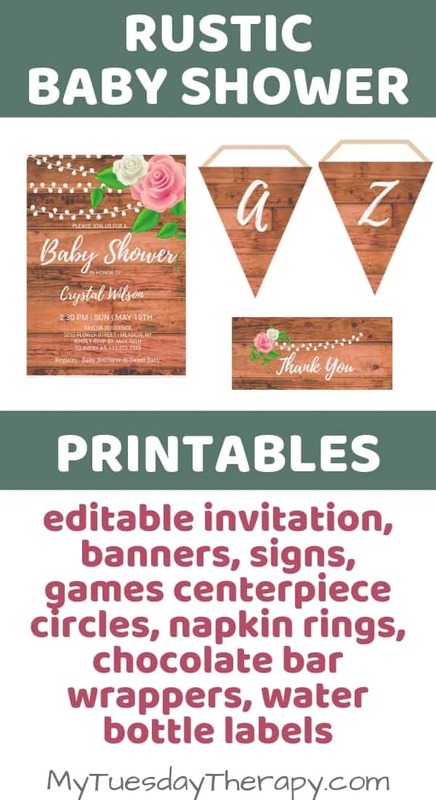 Invite family and friends to the country baby shower with cute invitations. You’ll get all three options (off white, blue, and pink lights). The invitation size is 5×7. You can easily edit it online free (You do not even need to create an account!). Instructions are included. You’ll also get a books for baby card you can send with the invitation. The mom-to-be will be delighted to receive books for baby’s library! With these banner pennants you can spell anything! Print as many as you’d like and write “welcome baby!”, “mom-to-be’s baby shower”, “it’s a girl”, “it’s a boy” and so on. Just print and cut the pennants. Fold back the flap and insert a cord or ribbon. You can also hang the banners with clothespins. 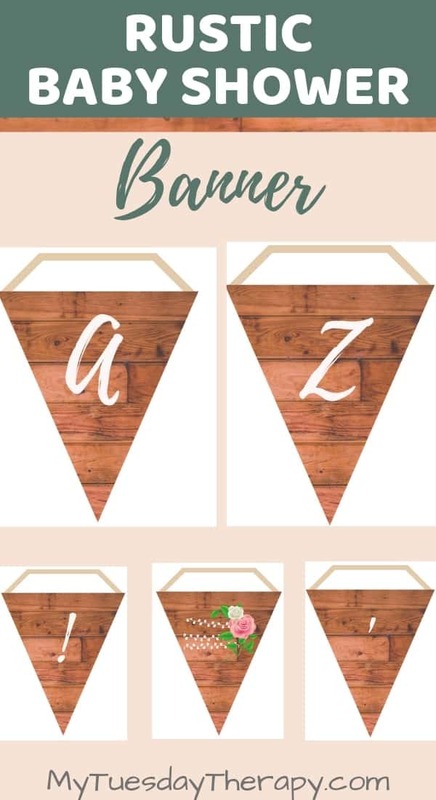 The banner pennants have letters from A to Z. Apostrophe, exclamation point, and three flower styles are included too. The banner pennant size: 6 x 7″. The light strings have off white lights. Wrap the napkins and silverware with cute napkin rings. You’ll get three colors as shown in the picture. Mix or match. Use various combos for each table or one style per table. Napkin ring size 7 x 1.5″. 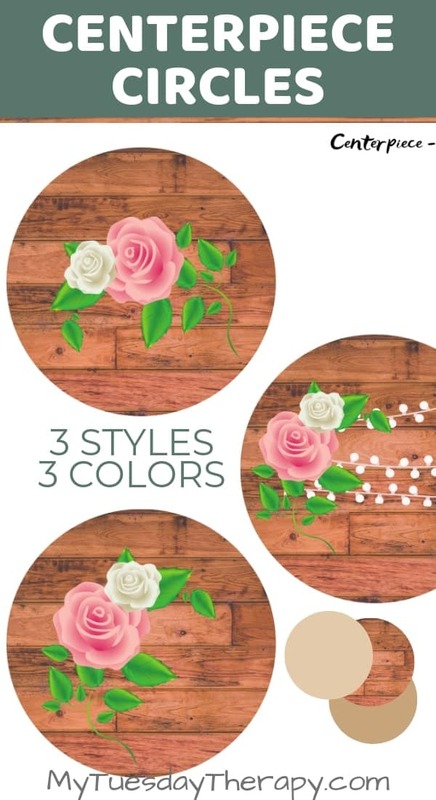 Centerpiece circles are an easy and cute way to decorate a country baby shower. Cut the circles and tape to dowels. Insert into vases by themselves or with flowers. You can also stick them into mini diaper cakes. 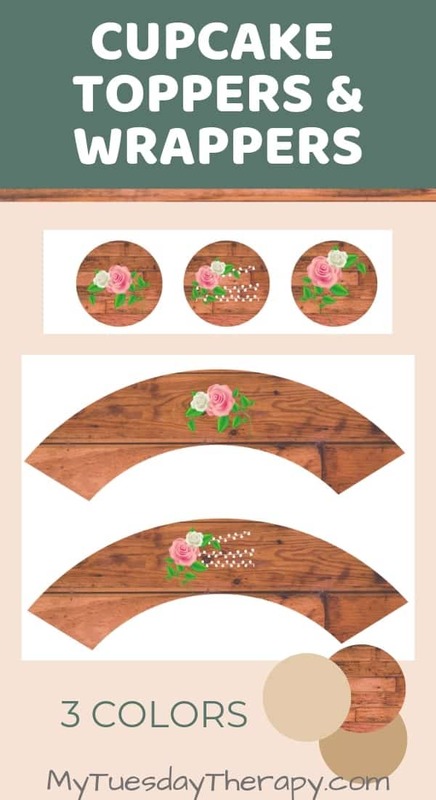 These centerpiece circles make also fun cookie “plates”. The circle diameter is 4″. Any cupcake will match this rustic baby shower theme when you wrap it with a cute cupcake wrapper. Attach the cupcake toppers to toothpicks or lollipop sticks and push into cupcakes. You can also use these to decorate other food at the shower like fruit and sandwiches. The cupcake toppers can also be used to decorate water bottles, vases, diaper cakes etc. They also work well as a favor or prize tag. Decorate water or soda bottles with these water bottle wrappers. They too have three color choices so you can pick your favorite or use them all. They can also be used for decorating vases or centerpiece boxes. Water Bottle Wrap size: 8 x 2″. Chocolate is an inexpensive baby shower favor and well received. The small chocolate wrappers work for Hershey’s full size bars (1.55 oz) and the large chocolate wrappers work with Choceur® (5.29 oz) from Aldi™ and Hershey’s™ large chocolate bars such as Symphony. 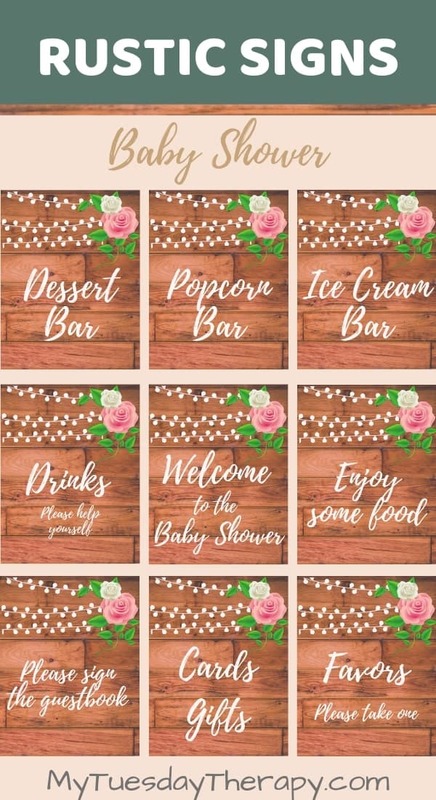 The rustic baby shower collection comes with 9 table signs. Printable baby shower games are easy, cheap and great ice breakers. 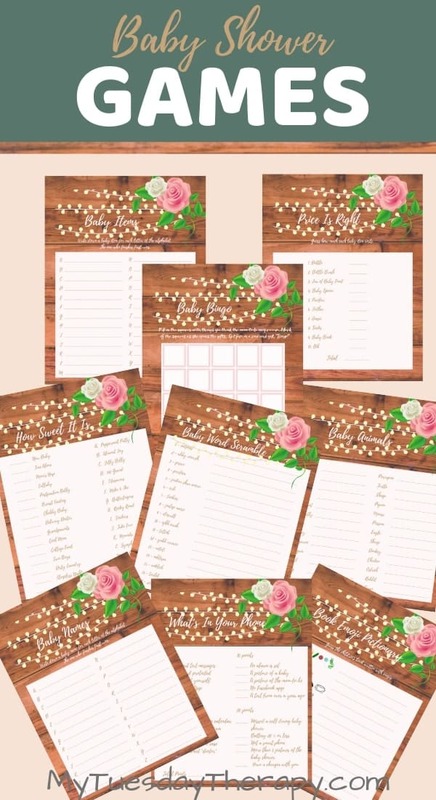 Your guests will chat and laugh together while filling out these cute rustic baby shower games. The light strings have yellow lights. “Don’t buy a pig in a poke” :). Test the colors by printing a sample page. 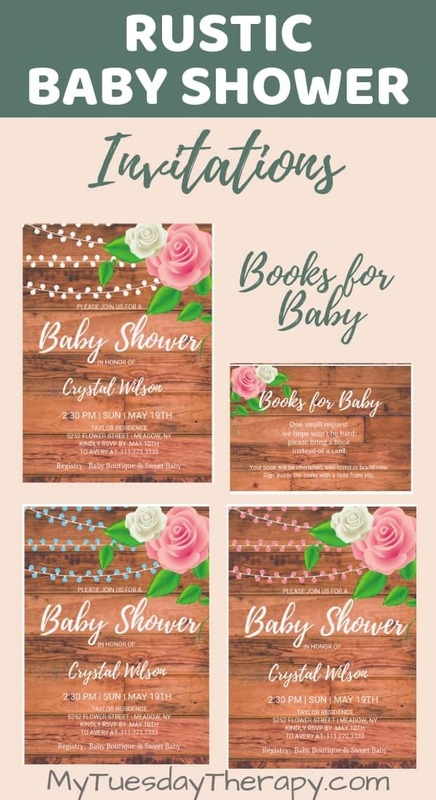 Rustic Baby Shower Bundle (74 pages) $14. Click to buy. 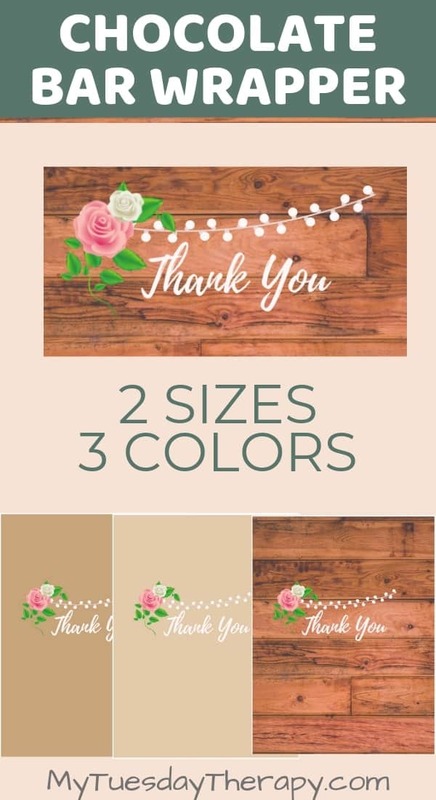 Invitation and Decorations (65 pages) $12. Click to buy. Games (9 pages) $4.99. Click to buy. This is a digital file, you will not be getting anything in the mail. You’ll get an instant access to the files and also an email with the download link. Personalized items take up to two weeks. If you are unhappy with the product, please contact me. Due to VAT in EU countries, this product is not available for customers in EU. Copyright Notice: This item is not a licensed product. I do not sell or claim ownership over the images or graphics; they belong to their respective copyright holders. Please note that you are paying for a creative service and the time spent designing the product. This is for your own awesome personal / non-commercial use only. And now that you’ve read all that stuff, place you order and make sure to check the subscribe box. I’d love to send you party and activity ideas for making memories!